Please register by clicking on the "Register" link in the upper right corner of the page. After filling in the form, you will get a confirmation e-mail. Please log in into your mail box and confirm your e-mail address within 24 hours (otherwise your registration will be deleted after this time period). You need to do it only once. After e-mail address confirmation you may log in by clicking on the "Log in" link in the upper right corner of the page. Please click on the "Edit profile" link in the upper right corner of the page. Here you may fill in your city, country, birthday, and you can tell us something about you (e.g. your field of study, your university, job). 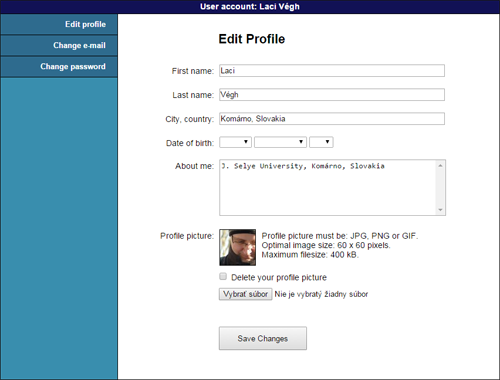 You can also upload your profile picture. We keep your personal data private! Only your first name and your profile picture will be published and visible for other users on the webpage! However, you might help us by filling in the whole form; your personal data will be used anonymously for research purposes only. Please click on the "Categories" menu item. Here you can find different animations. Try to examine as many animations as you can. After examining the animations, you can rate them by clicking on the stars under the animations. By rating you are helping other users and researchers to decide which kind of animations are useful. If you found an animation, which you really liked, you may add it into your favorites by clicking on the hearth (+) icon under the animation. You can find all of your favorite animations under "My favorites" menu item. You can write review to every animation using the form below the animation. After submitting your review, you may edit it for 24 hours. After this period your review is closed. In case it is needed, your review may be moderated, hidden, or deleted by the moderator of the website (e.g. improper, indecent review). By writing a short, but qualitative reviews, you are helping other users and researchears. After reading your reviews we can easier decide what kind of animations are useful for you, so in the future we can add more of that type of animations into the collection.